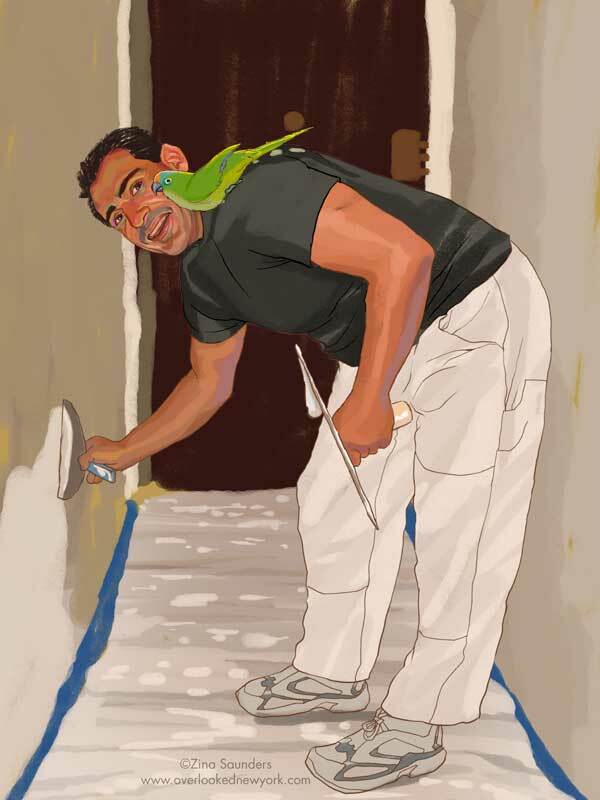 Bobby, house painter, age 41, and Copa, conure parrot, age 7, have been a team for five years. He thinks she's the perfect companion, even though she's a bit tempermental. “I never think of Copa as a parrot; sometimes she's like a little girl, and other times she's like a grownup. But I think she thinks she's a little human being. "She goes pretty much everywhere I go. I take her to the park, I take her to the beach—she loves the beach. Sometimes I just make time for her. She goes bike riding with me, if its not too windy; I can't ride near the water, because I'm afraid she'll blow off and land in the ocean. And she'd be in big trouble, because she can't swim! "I try to bring her to work, but I have a busy schedule in the evenings, so if I have an evening activity after work, or if I'm gonna run or if I've got school, I can't bring her. "She's in a cage at home, but the cage is always open, and there's a perch on top of the cage, so at nighttime when the sun goes down, she climbs into the cage, and she sleeps, and then in the daytime she climbs out of the cage and she goes up to her perch. "When I don't bring her to work, and I come home and I'm tired and I don't pick her up, she'll climb down the cage, walk across the room, up my leg, and onto my shoulder. And sometimes, I'll go to pick her up, and she doesn't want to be picked up—she's upset that I left her all day, you know? "When she's really happy, she cuddles with me: she puts her head up under my nose and rubs herself and gets real quiet. And when she's angry, her eyes dilate and her feathers get really blown up...and you know she's angry. I've seen her chase a friend of mine out of the room—a big guy chased by a little bird! And she's very jealous; she really dislikes women. I don't know, she's a redhead!"